Kumasi, Jan 23, GNA - Ghana's National Under-17 soccer team, the Black Starlets on Sunday beat their Ethiopian counterparts 3-0 in their second leg encounter at the Kumasi Sports stadium to qualify for the Africa Under-17 Championship scheduled for the Gambia. The Starlets who lost 1-2 to their Ethiopians counterparts a fortnight ago in Addis Ababa, qualified on 4-1 goal aggregate. While the Starlets reached this stage with a 5-2 aggregate win over Tunisia, their opponents gained an automatic qualification following the withdrawal of Egypt from the competition. The Starlets in an all-white jersey, scored their first goal in the 14th minute through Jonathan Quartey from a 30-metre free kick after Opoku Agyemang had been brought down. 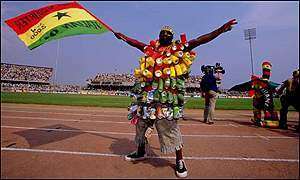 The Ethiopians who seemed undaunted by the early goal, kept their composure and made series of attacks in search for the equaliser but the strong defence of Ghanaians stood gallantly to repulse their threat. Starlets who looked more purposeful, counter attacked from all angles and in the process, Opoku Agyemang was fouled by Tesfaye Seyoum and was shown the yellow card in the 41st minute. Both teams resumed the second half strongly but it was the Starlets who were on top and scored their second goal in the 64th minute through the spot kick that was expertly taken by Quartey after Agyemang who attempted to score was tripped in the box. The "steaming" Ethiopian players continued to pile on the pressure for a goal but Agyemang who had been the thorn in their defence made amends to his near misses to score his personal goal against the run of play in the 72nd minute to record Starlets third goal. In the 86th minute, Alex Tesema missed a glorious chance for the Ethiopians while the skipper of the side, Tesfaye Belete also hit the wood work two minutes later to deny them a consolation goal. The Ethiopians continued their search for a consolation goal but that eluded them as the Ghanaians managed to repulse all their moves till the final whistle to qualify them for the African Youth Championship.